(TNS)—Spring and summer are traditionally the busiest times in real estate, for both homes and apartments. Home shopping is more pleasant in the balmier months, moving is typically easier, and longer, sunnier days tend to give people more time to search for new digs. Yet whether someone is hunting for a new home or staying put, tough decisions could await many this spring. For apartment tenants who found a home during the busy months of last year, lease renewals are likely approaching—and that could mean rent hikes. A landlord’s asking price is never final, especially in today’s market. Here are some tips for negotiating. In many states, before a landlord can increase rent, a tenant’s lease must be expiring; rent cannot be changed during an active lease. In addition, your state or city may require landlords to provide advanced, written notice of any rental price change. Often, individual leases dictate how far in advance landlords must notify tenants—typically requiring 30 or 60 days. Even if a lease does not specify, state law often does. Pennsylvania and New Jersey, for example, require landlords to give a 30-day warning of a price change before a residential, market-rate lease ends. If a landlord does not, “they cannot increase the rent,” says George Gould, a senior attorney at Community Legal Services of Philadelphia. Philadelphia is even more specific: Unless a lease stipulates a longer period, the Philadelphia Code requires landlords to notify tenants 60 days before they increase rent for year-to-year leases, and 30 days before for shorter leases. When it comes to actually raising the rent, however, Pennsylvania offers fewer restrictions. 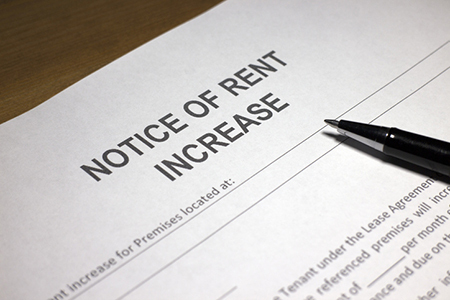 Pennsylvania has no statewide laws governing rent increases for market-rate units, meaning, in theory, landlords can hike rent as much as they want. New Jersey, similarly, has no statewide law, though nearly 100 municipalities have enacted rent-control ordinances that set increase limits. New Jersey does, however, stipulate that rent increases may not be “unconscionable.” Though no formal definition of “unconscionable” exists, Legal Services of New Jersey interprets it as any increase that is “extremely harsh” or “unreasonable.” In some cases, the nonprofit says, that could mean a 20 percent hike, or even a 5 percent increase if the building’s conditions are very bad. Many cities have experienced an unprecedented housing boom in recent years, meaning there’s more supply than ever for renters to choose from. Much of that inventory, including in the suburbs, has been high-end apartments—the kind that demand prices greater than $3 per square foot. And while such inventory has forced prices to jump, many buildings are providing “concessions”—a month of free rent, for example—to lure tenants. Accordingly, the actual price of renting is often cheaper than advertised. In many places, rent growth has dipped as vacancy rates have gone up. As a result, you should study the market, including average prices in the neighborhood or in comparable buildings. And, simply, ask (nicely) to negotiate. Landlords may negotiate with reasonable, informed residents. Remind your landlord of your record. “In the business of renting apartments, it’s very costly to turn over tenants,” says Allan Domb, a Philadelphia councilman and real estate broker. Turning over a one-bedroom unit, including repainting, carpet shampooing and cleaning, can cost $500 to $600, Domb says, and searching for a new tenant takes time—and money. Landlords who find tenants through real estate brokers often must pay the agent a commission of one month’s rent. “Landlords really do not want to pay that one-month commission every year,” says Alan Nochumson, a Philadelphia real estate attorney. A tenant who pays on time, maintains the apartment and complains infrequently should remind their landlord of that. Landlords would rather keep well-behaved tenants than pay turnover costs to find an unknown tenant. Often, offering to a sign a longer lease can bring the monthly price down—or mom-and-pop landlords may reduce the price if a tenant offers to pay multiple months upfront, thereby reducing the risk of missed payments. If that does not work, ask if a landlord will budge elsewhere, such as on waiving a parking fee or prioritizing maintenance. Your landlord may be willing to fix that hole in your wall if you agree to his or her rent terms.